Use these links to navigate within in this site. To go directly to our online store, use the links on the side bar. 2010 – Celebrating 34 years in Paradise, CA! 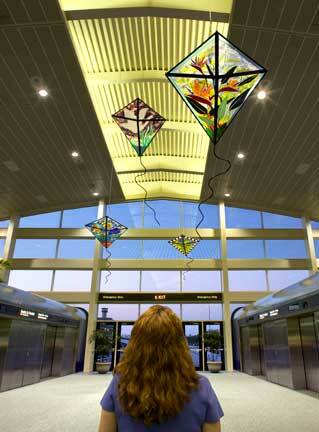 Creating custom art glass & sharing our love for this art through teaching and every day commitment to our customers. We’re the place to shop for all your art glass supplies in Paradise and Online! Our dedication to sharing our passion for art glass by teaching, creating custom glass and helping our customers, makes us the #1 Art Glass store! Our customer service and dedication to our community is second to none. Creative Glass Carvings has been creating custom art glass (stained, fused & etched), teaching classes and offering art glass supplies to fellow glass enthusiasts in our town and online all over the United States for over 33 years. 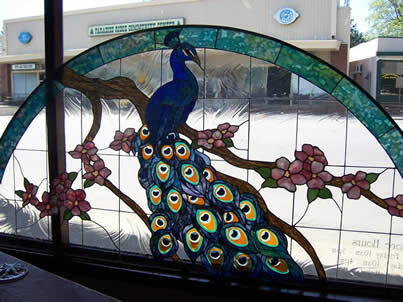 Owner, Pamela Funk, started working in art glass professionally at the age of 16. Having been an artist all her life the transition into glass was exciting and new. It became a lifelong passion that she still enjoys today and still challenges herself to find creative ways to work in glass. Working in glass fusing is the newest addition to classes offered at Creative Glass Carvings and custom work. Check the class schedule by clicking on “class schedule” on the gold bar above. Nine years ago, in support of Paradise’s downtown revitalization, Pamela moved her studio to downtown Paradise, where her and her husband Hal added a new facade to the building and added an art gallery gift shop called Fir Street Gallery & Gifts. Her daughter Carly joined her in running the art gallery and the art glass studio by working side by side on not only creating custom stained glass, teaching stained glass and fusing classes but helping customers choose glass, demo tools and give advice on their projects. We’ve since added The Wine Room to the building. Our students love being able to enjoy a glass of wine while they work on their projects. On the third day God created the land and plants. We have completed days 2 & 3 and will be working on day 5 next. Foot Stomp Lamp in progress. This piece includes fused and slumped pieces with hand painted gold paint accents. These photo’s are actually the backside (it takes three of us to turn it and I didn’t want to turn it again!) To view more pictures of this beautiful peacock that was constructed with fused and stained glass combined, click on the picture. 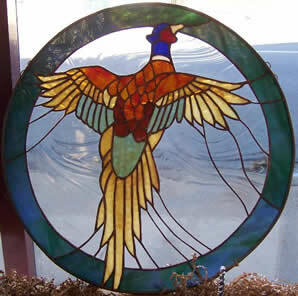 Pheasant Window 18″ round. 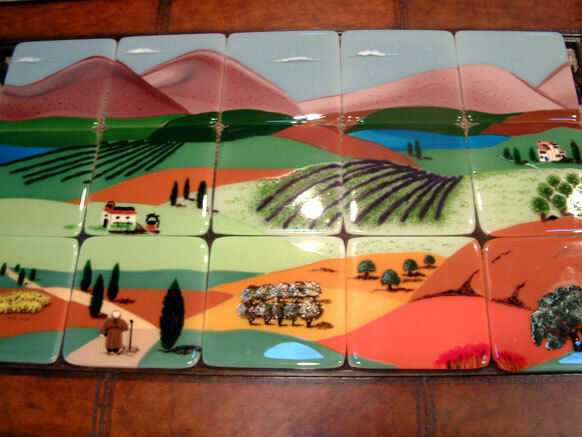 Fused Tile Mural in progress by Dianne Callin. Creative Glass offers fusing classes! Come by and see the beautiful fused pieces from the fusing classes. We offer beginning fusing class most every month (check our online class schedule). click on “Fusing Class” from the sidebar. check our online class schedule for dates. your while… and we won’t share your address with anyone! Just click on the “Sign Me Up” and type “Add Me” in your email and type your name in the body of the email. These links will take you to our online store. To navigate within this site, use the links in the gold band above. Join our email list & receive online savings!